Nothing beats a good ghost story. Ghosts occupy a space between tragedy and terror, where no matter how horribly they might rattle their chains, a piece of them remains recognizable—even sympathetic. They illustrate what happens when longing and isolation are bottled up for too long, fermenting into something inhuman. 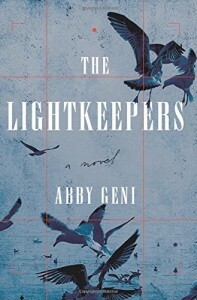 In that way, Abi Geni’s novel The Lightkeepers is the perfect ghost story, and so much more. It is full of a deep, detached sorrow—it is frightening, upsetting, disturbing. It creeps up on you. It embodies the sensation of looking over your shoulder in a dark room, and finding nothing there. Geni’s novel follows Miranda, a nature photographer with a penchant for the remote. Her work continuously brings her to places far from civilization, until she is more comfortable with loneliness than in the company of other people. She becomes accustomed to seeing life through the viewfinder of a camera—always with a degree of separation. And from the moment she sees a picture of the stark beauty and solitude that is the Farallon Islands, she knows it’s where she belongs. As a photographer, Miranda is well acquainted with the concept of a Dutch Angle: when a camera is tilted to the side, throwing the entire frame out of balance. It is a technique often used to create a sense of unease, menace, even madness. The Lightkeepers itself is a story set at a Dutch Angle, skewed away from the rational world in violent and upsetting ways. Rarely have I ever seen a piece of literature capture loss so accurately, and so beautifully. It paints loss as an absence so powerful that it becomes its own presence—like the light and dark that define a black-and-white photograph. It is this stark absence that comes to form the axis of Miranda’s life, and ultimately sends her to the Farallon Islands. Yet loss is not all that Miranda must struggle with during her time on the Islands. Within weeks of her arrival, she is sexually assaulted by one of her fellow researchers. Shortly afterwards, the man is found dead—fallen to his death on the treacherous rocks. These events are the forces that tip Miranda over the edge, shaking her own understanding of herself to its core. As a result, Miranda throws herself into her work, using photography to try and understand the islands themselves. The longer Miranda remains on the islands, the more their savage beauty both compels and repulses her. The islands are all of her sharp pieces of pain and seclusion made real, populated with creatures that kill and maim and breed, only to kill again. Yet there is beauty beyond the brutality, and as a nature photographer, Miranda is already skilled at discovering it. When looking out on the rocks and icy water crawling with dangerous sea life, Miranda’s reaction is not so unexpected: “I wanted it all. I was a woman possessed. I was falling in love.” Her connection with the islands is deep, borne from much more than an appreciation of their strange beauty. They have been a part of her for a long time. Ultimately, Miranda’s choice is simple. She can either remain on the islands, embracing the isolation she has sought her entire life—or she can move on from the pain that etches itself inside of her, and begin a new life. She says it herself: “these islands are the last refuge for people like me.” There is nowhere else for her to go without leaving everything behind. The Lightkeepers is not a novel that can be summed up in a neat concluding line. It is brutal. It is lovely. It is both of these things at once. The darkness borders the light, defining its limits, lending greater depth. In the end, they are inextricable. Amelia Fisher is a writer and recent graduate from Fairleigh Dickinson University, living in Virginia and aspiring to Portland.